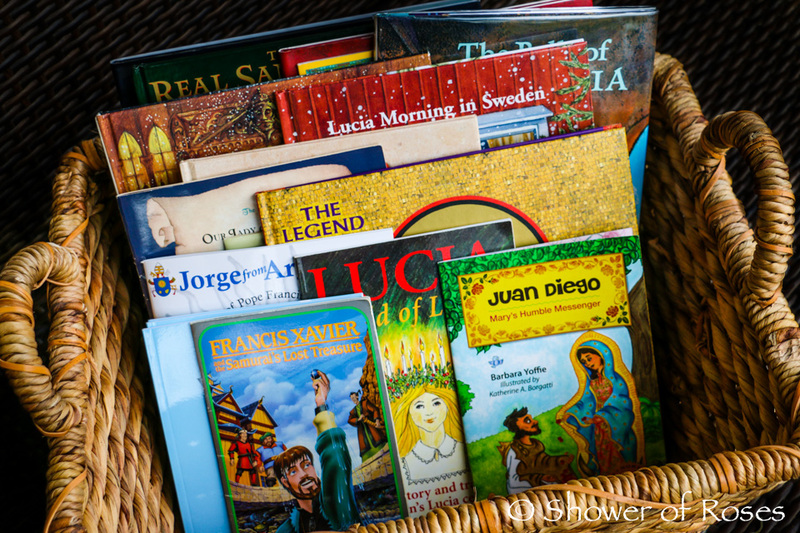 At the beginning of each month I fill a basket with books featuring the the various saints whose feast days will be celebrated during the month and place it in the living room. Throughout the month I will find the children curled up on the couch reading books they have chosen from the basket, either on their own or to their younger siblings. I also choose books from the basket for some of our afternoon family read-alouds. Our collection started very small and we have continued adding additional books over the years which we have either purchased or have been given as gifts. Some are picture books, some are chapter books, and some are collections of saint stories. This post is a work in progress and I will continue adding links as I sort through our collection. All the links in this post are Amazon, TAN, or Holy Heroes affiliate links. If you choose to click any of the links, then add an item (any item!) to your cart and complete the purchase, I will receive a commission. We are so grateful for this additional source of income. Thank you! You can find links to all of our book lists here.